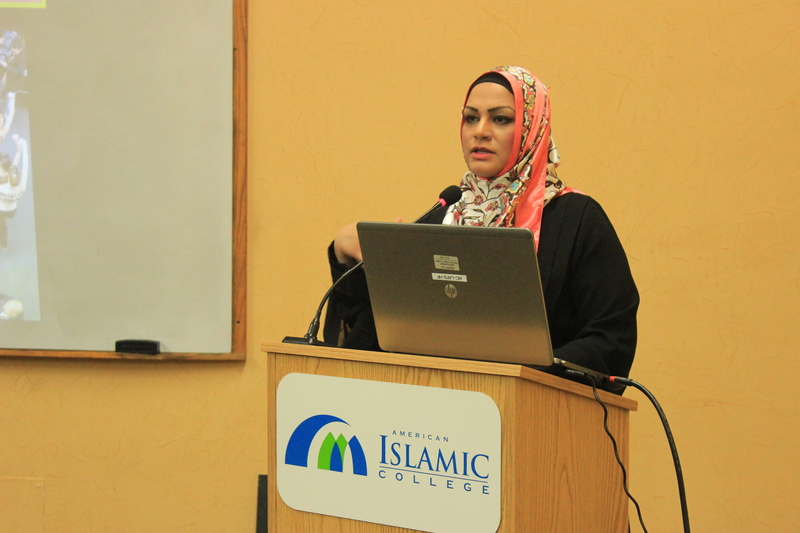 On Tuesday, March 1, AIC welcomed Shaykha Tahera Ahmad, Assoc. Chaplain and Director of Interfaith Engagement at Northwestern University. She opened the program with a beautiful recitation from the Qur’an. Sr. Tahera shared her own spiritual journey, which for her began right after 9/11. Muslim women were the main targets of Islamophobia, and so, discrimination toward Muslim women was heavily felt. This raised a lot of critical questions for conversation and self-introspection among the Muslim community. Her talk was thoughtful and thorough. You can view the video recording below. Ahmad serves on the board of ACURA (Association of College and University Religious Affairs) and is the co-president of the ACMC (Association of College Muslim Chaplains). She has supported leadership for premier Muslim organizations including the Islamic Society of North America, Inner-City Muslim Action Network, and the Council of Islamic Organizations of Greater Chicago, and served as the Department Head of Islamic Studies at the Nation’s largest Muslim Schools, the Islamic Foundation, Villa Park IL. Ahmad is a passionate advocate for social justice and works with young adults in the interfaith movement on artistic and athletic projects to help develop a balanced faith identity in a diverse global world. She has been featured on NPR, Chicago Public Radio, Chicago Sun Times, USA Today, and recently featured in the national PBS documentary titled The Calling, which portrays the struggle of faith in the 21st century for leaders from the Jewish, Christian, and Muslim faiths. Ahmad is a renowned speaker and has worked closely with the U.S. State Department through leading international workshops on cultural awareness of Muslims and religious diversity. She was recently recognized and hosted by President Obama at the White House for her interfaith work and collaborative initiatives. Ahmad has received graduate certification in various religious fields including Applied Spirituality in Women’s Leadership from the Women’s Leadership Institute at Hartford Seminary, Ijaazaat or classical certification in Quranic Recitation, Arabic language and Islamic sciences from Al-Diwan in Cairo, Egypt. During her graduate studies at Hartford seminary, she served as the Muslim Chaplain at Mt. Holyoke College in South Hadley, Massachusetts. Currently she serves as the Director of Interfaith Engagement and Associate Chaplain at Northwestern University.